When venturing out into the great big world, you know how one of the first tasks a child is given to do is push the buttons in an elevator? This simple action gives them independence, responsibility, empowerment, purpose. Plus, it’s pretty fun to think the magical box of the elevator delivering passengers from floor to floor is at the mercy of their tiny button pushing fingers. Growing up in southwest Missouri many buildings were one floor. Have you heard me tell the story of when our JC Penney store at the mall built a second floor? There was an actual field trip to teach the children of our town how to safely get on and off an escalator! I missed out on the glories of elevator button pushing as a child. I suppose I got my independence and empowerment in other places. Pushing buttons as an adult is a very different thing. For the most part, it’s framed negatively. We’re triggering someone. We’re setting them off and activating their frustration, sadness, or anger. Or we’re the ones being tested. Our buttons are pushed and we react poorly. We lash out in rage. We breakdown. Or even shut down. No bueno. You know what I’m talking about, right? We work so hard at something - behaviors, thought patterns, and controlled actions. And then someone comes along, pushes our buttons and all the hard work goes up in smoke. They say or do the thing that just unravels us. We feel manipulated. We feel trapped or cornered and gradually we lose control of the situation. We lose our cool. And sometimes there’s not an actual person behind the button pushing. It can be an image we see, a news piece on the television, or a song that comes up on Spotify. Those things grab us in just the wrong moment to ignite the spark of anger, irritation, or exasperation. So are we just helpless to the deliberate as well as the random button pushing of the world? The James Hotel in NYC has a lobby wall of these keyboard buttons. I am not lying when I say I sometimes go into the lobby and just press all the buttons. I say no. Button pushing isn’t all bad. Ultimately, when our buttons are pushed, it’s a release. There’s actual tension or pressure behind all buttons - literal or figurative. When they are pushed, that release is freeing. It’s liberating. Something is being let go to relieve the tension and pressure. This is good news! When someone is pushing our buttons it often has very little to do with us. They need attention. They’re feeling unheard and unseen so they do the thing that will make us snap and notice them. Or they’re feeling out of control and are looking for a way to take command of their situation. So what to do? First thing: Guard your mother board. That elevator panel of buttons in the lead photo is in the building of a longtime client who lives on the 37th floor. 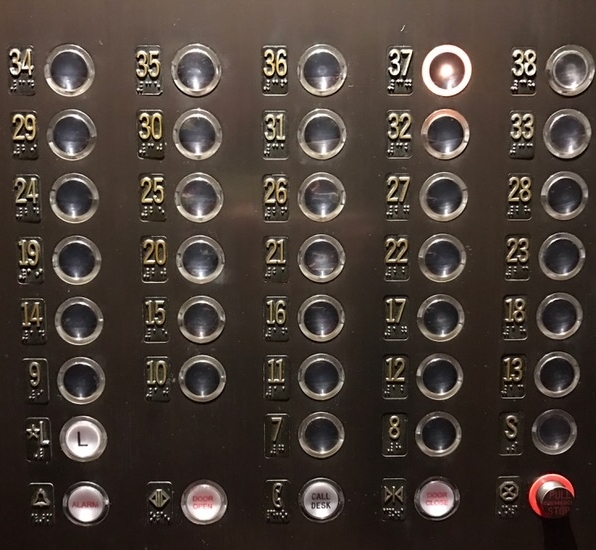 If a child comes in to the elevator exerting their button pushing abilities and lights up every button - I’ll never get to the 37th floor, right? The same thing goes with our own personal mother board of buttons. Stay focused on where you’re going and what you’re doing. Don’t let someone else’s button pushing derail your journey. Secondly: If your buttons are pushed, have an image in mind of a release. Maybe you’re letting out a held breath, or releasing a balloon tied to a string, maybe you’re falling backwards into a bed of fluffy pillows or into a cool swimming pool. Perhaps it sounds silly to arm yourself with one of these images, but find something that works for you. Let that be the shut off valve to the triggering words or actions of others. Let that image in your mind be pushed. Let it release. Feel the relief from the pressure or tension in the situation losing its power. And I’ll add a third thing. Seek out the button pushers that release the good stuff. Who are the people that make us smile? That ignite the sparks of love and happiness? Pay tribute to those that push our buttons of laughter and joy. Be grateful for the ones who trigger our safety, our acceptance, our strength. And if all else fails, bake bread! Knead out some tension. Knead in some compassion. Punch the dough down and watch it release and pop back up. 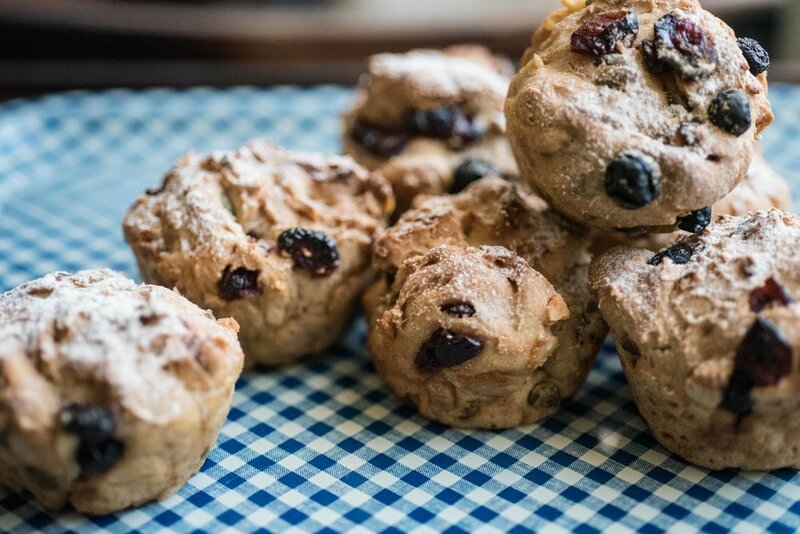 With all the dried nuts and fruit, these muesli rolls look like they're full of buttons! I created this recipe for Stoneridge Orchards using their dried fruit. Cheryl Stockton of Stockshot Studio took the amazing photos. 1 Combine warm water yeast, salt and flours in a stand mixer, beat at medium speed for about a minute.It will be sticky. 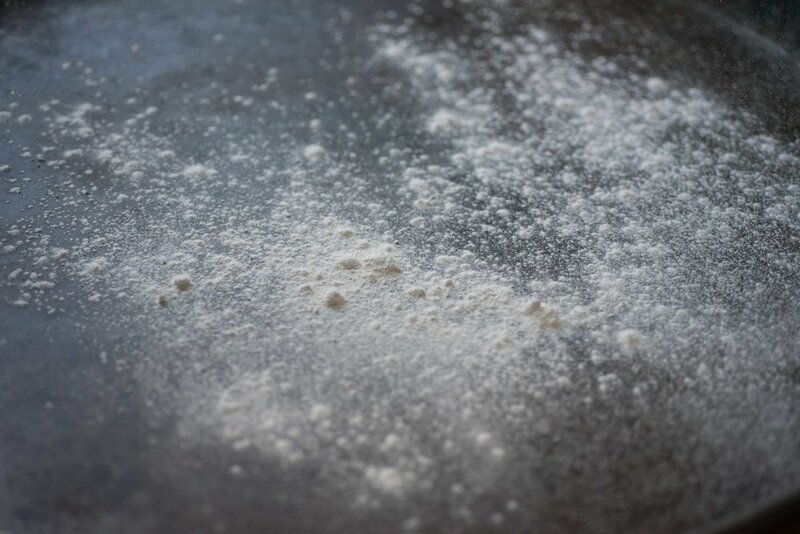 2 Lift the dough out and lightly grease a bowl with nonstick spray or olive oil. Cover and let rise in the refrigerator for two hours. 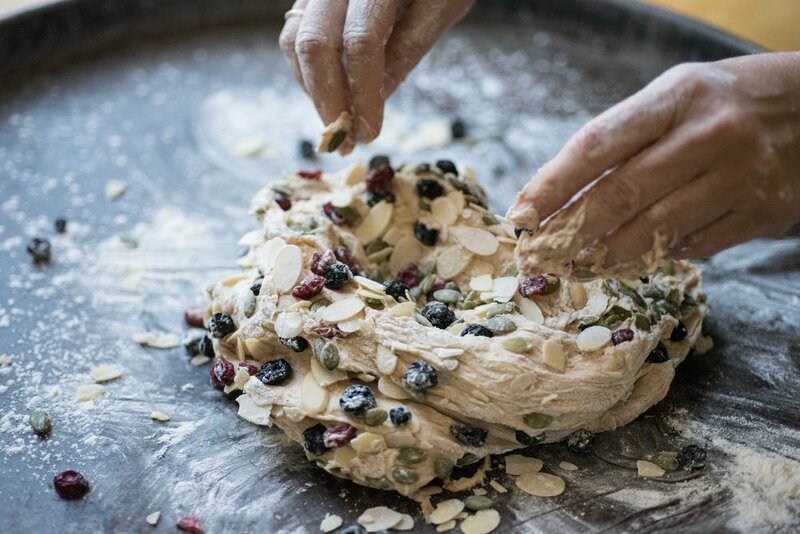 3 Knead a few times inside the bowl and then add pumpkin seeds, almonds and dried fruit. Knead until until just combined. 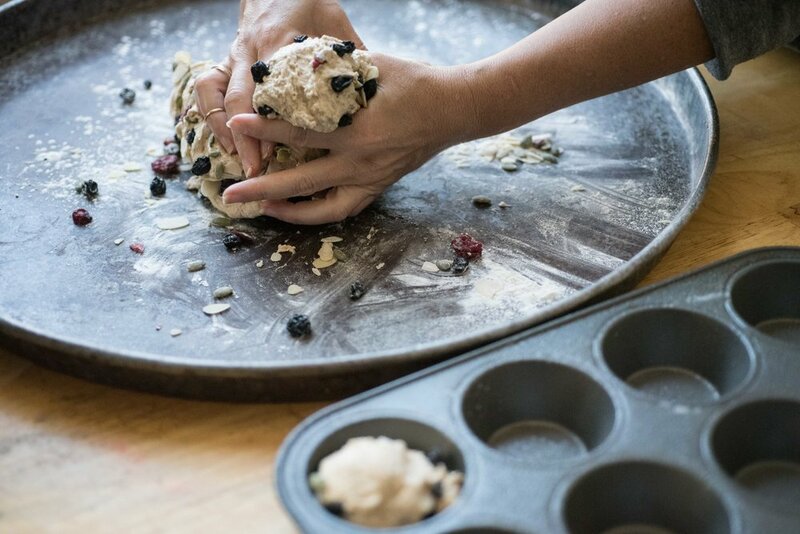 4 Squeeze off balls and place them into a non stick spray treated muffin tin. Sift a light coating of flour over the top; to help keep the dough moist. Let rest on the counter for 45 minutes. 5 Preheat oven to 450°F while the dough rests. Place a pan with 2 cups water on the lower rack of the oven. This will create steam to keep the rolls moist. 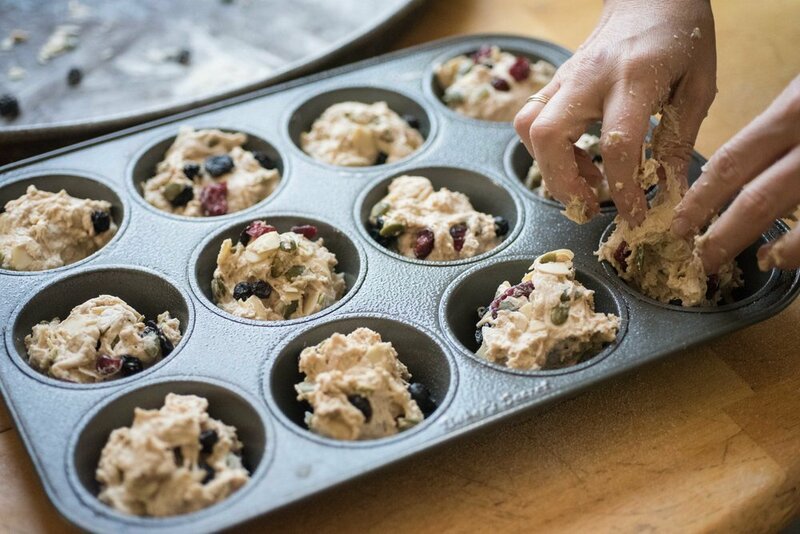 6 Place muffin tin in oven on the top rack. 7 Bake the bread for 25 to 35 minutes, or until deep, golden brown. 8 Remove the rolls from the oven and cool on a rack.